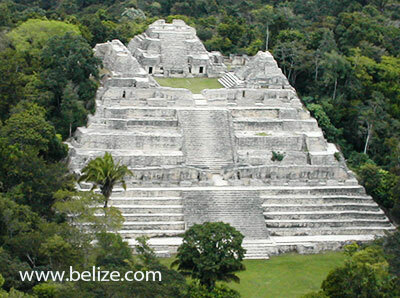 Known as the epicenter of the ancient Maya world, Belize once was home to more than 2 million Mayas. Sacred temples, pyramids, advanced science, agriculture, mathematics, palaces, and awesome structures are their legacy. Without the use of iron or the wheel, the civilization reached its zenith at the time when Europe was in the Dark Ages. This advanced civilization - supported by vast agricultural farmlands and trading centers, held sway for well over 2,000 years. The Maya Empire evolved around 350 B.C. in the tropical lowlands Belize and northern Guatemala and reached its apogee from 250 A.D. to 900 A.D. The arrival of the Spanish conquistadors in the 16th century spelled the beginning of the end of the Maya civilization that had already began a decline with many of its great cities and monuments abandoned perhaps due to war, famine or break down of government structure. The Maya civilization has permanently marked the landscape, as these top ten Belize Maya Sites show. 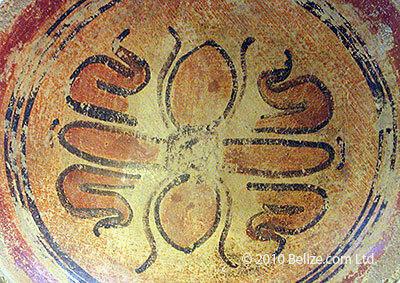 Photo: Detail from ancient Maya plate found at Actun Kabal cave in Belize. Xunantunich means “maiden of the rock” or “stone woman” in Maya, and is situated on the Western Highway across the river from the village of San Jose Succotz. It can be reached by ferry daily between 8 am and 5 pm. This site is less than one mile from some lovely rapids of the Mopan River and provides an impressive view of the entire river valley. Xunantunich is a Classic Period ceremonial center. The site core occupies only 300 square meters but the periphery covers several square kilometers On the main palace building is an astronomical carved frieze. 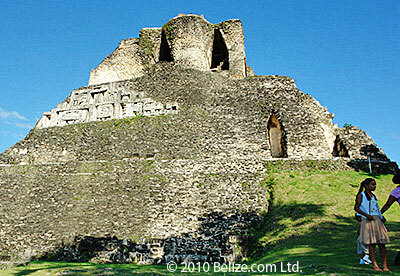 The highest ruin is 133 feet tall, the second tallest ruin in all of Belize. Well-preserved sun god masks decorate one side of the structure. Six major plazas, more than 25 temples and palaces and a new museum are just some of the reasons why Xunantunich is one of the most visited sites in Belize. The Belize Tourism Development Project has invested over half a million dollars to fully excavate the site and make it more visitor-friendly. Altun Ha is located 31 miles north of Belize City on the Old Northern Highway. A two-mile dirt road connects the main road to the site. The area around the Altun Ha is rich in wildlife including armadillos, bats, squirrels, agouti, paca, foxes, raccoons, coati, tyra, tapir and the white-tailed deer. Two hundred species of birds have been recorded and there are large crocodiles that inhabit the Maya-made water reservoir. Altun Ha, a major ceremonial and vital trade center during the Classic Period, has two principal plazas. The most significant find of Altun Ha is the “Jade Head”, which represents the Mayan Sun God, Kinich Ahua; it is the largest object carved of jade in the Maya civilization. Located on the western edge of the Maya Mountains within the Chiquibul Forest Reserve, Caracol lies on a high plateau of 500m above sea level that drops into a deep valley to the northwest and rises into hilly terrain to the southwest. The site was discovered in 1938 by Rosa Mai, a logger looking for mahogany. That same year the Archaeological Commissioner, A.H. Anderson, visited the site and named it 'Caracol' (Spanish for 'shell'). Caracol – Although one of the most challenging Belize ruins to reach, the trip to Caracol is also one of the most scenic drives. It is the largest known Maya center within the country and holds "Canaa" (Sky Place), the largest pyramid or man made structure in Belize at 140 feet tall. A large part of Caracol is largely being discovered, but numerous carved monuments populate the area, and the main reservoir is an engineering masterpiece. Cahal Pech is located on an imposing hill that overlooks the twin towns of San Ignacio and Santa Elena. The name of the site means "Place of Ticks" in the Yucatecan Maya language. This name was coined in the 1950's when the area around the site was used for pasture. Research in 1988 found ten mounds. Excavations show that Cahal Pech was inhabited from 1000 B.C. to around 800 A.D. The central part of the ruins provides a beautiful panoramic view of the surrounding area. Thirty- four structures, including temple pyramids, two ball courts, an alter and five plain stelae fill the 2 acre area. A Mayan ruin in northern Belize that dates from 2000 B.C., Santa Rita is what remains of Chactemal (modern-day Chetumal, Quintana Roo Mexico) an ancient Mayan city that is the genesis of the Mestizo people after the first European contact in the region. Santa Rita controlled trade routes within the boundaries of today's Mexico and Guatemala. Excavations have revealed fishing net sinkers and other objects, which point to Santa Rita's coastal importance. Remains of rulers with jade and mica ornamentation, as well as others with gold ear decorations, show that the Mayan city had a commanding role for trade in the Yucatan Peninsula and surrounding areas. Santa Rita is located on the outskirts of Corozal Town and is bordered on the east by the Caribbean Sea. This site of Santa Rita was first settled by Maya farmers around 1000 BC. Evidence for this early phase of occupation is provided by Swasey style pottery that represents some of the earliest ceramics discovered in the Maya lowlands. In the late Preclassic period, from 300 BC to A.D. 300 the settlement expanded but continued to be based primarily on agriculture. The modern town of Corozal was founded in the mid 1800s and encircles the ancient city of Santa Rita. At its height this site extended from present day Paraiso in the north to the south end of Corozal. This site, bordered on the east by the sea, is situated on a limestone plateu typical of northern Belize which supports a low forest where game abounds. Just north of the center is the Rio Hondo. Along its banks there are large areas of swampland where the Maya created raised fields. These supported the cacao plantations for which the province was famous. The seacoast gave this site access to a wide variety of marine resources. Santa Rita is located on the outskirts of Corozal just off the main road leading to the Mexican border. Frequent buses between Belize City and Corozal pass by this site.